Hanna is a black and red pistol. She is the litter sister to Red. We are honored to co-own her with Kent Boyles. Hanna earned a 5-point major reserve as a youngster, under the knowledgeable Morton Goldfarb. 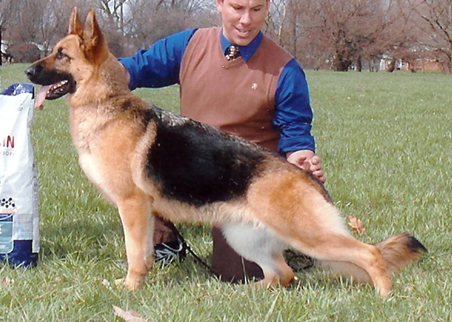 She is the last daughter out of the famous German import, 2X VA Can Sel CH Am CH Jim vom Fiemereck SchH3 TC ROM KKL1a Life OFA H/E.